Minister for Foreign Affairs Ratu Inoke Kubuabola (third from left), with former Fijian nationals at the 136th Girmit Remembrance Day at Skipton Hall, Mangere in Auckland, New Zealand, yesterday. 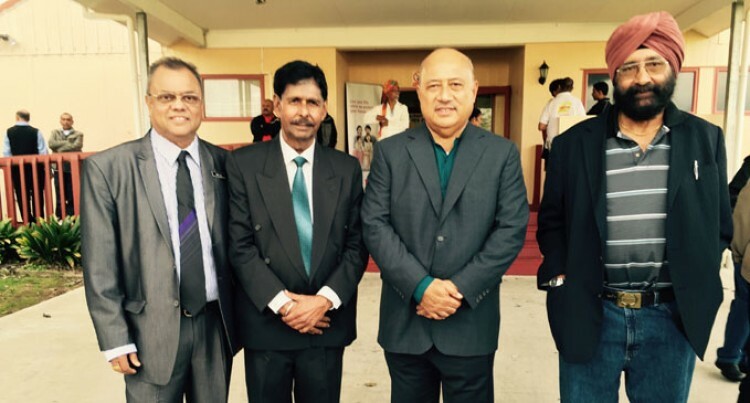 Indo-Fijians in New Zealand were yesterday encouraged to consider opportunities of setting up businesses in Fiji. Minister for Foreign Affairs Ratu Inoke Kubuabola made this statement while officiating at the 136th Girmit Remembrance Day at Skipton Hall, Mangere in Auckland, New Zealand yesterday. Ratu Inoke said there was a range of opportunities available in the country for investment and trade. “Investor confidence is back, particularly after the September election. Two weeks ago, a New Zealand business delegation was in Fiji to explore business opportunities and positive reports have come out of that visit. Some members of that delegation are Fijians living here in Auckland,” Ratu Inoke said. He said there were also opportunities for charitable work. “They come to Fiji at their own cost and provide free treatment to disadvantaged Fijians who would have never been able to access such services otherwise. There are opportunities for individuals and groups to help the less fortunate in Fiji and be a blessing in their lives,” he said. Ratu Inoke said as the arrival of Girmitiyaas was commemorated by every Fijian, it was also a good time for Fijian Kiwis to have second thoughts about Fiji. “You too can be part of this journey of building the new Fiji. I know some of you have regained Fijian citizenships in the five years since Fiji allowed dual citizenship. And I urge others to consider this as an option,” he said. The first batch of Girmitiyas arrived into Fiji on May 14, 1879, on board the Leonidas.